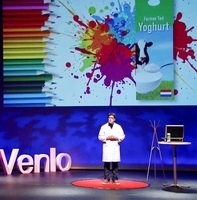 22 Jan 2019 --- “It’s not what you read,” says packaging design expert, Marc Pruijssers, during his recent TEDx Venlo talk on visual language, “it’s what you see, is what you get.” Pruijssers demonstrates that the most aesthetically-pleasing design choice is not always the most commercially effective and that a more scientific approach to packaging design is required. He speaks to PackagingInsights about the power of visual language in connecting consumers with packaging at the all-important point of sale. Pruijssers: My talk was inspired by my observations of how consumers interact with food packaging. This is mostly subconscious, and at this subconscious level, written language is much less important than visual language like pictures and icons. It’s not what you read, it’s what you see is what you get. During my talk, I presented four powers of visual language. Visual language is our most universal language, a very precise, accurate and effective language, our natural language, and also a very efficient language. We can already see how society is changing towards this new language. Smartphone cameras have replaced fountain pens and typewriters, and emojis have won over type fonts. Click to EnlargeLay's Sensations: A notable example of strong visual language in packaging.PackagingInsights: What scientific evidence is there to suggest that our brains are more adept at processing visual cues compared to verbal/textual language? Pruijssers: It is often quoted that science indicates that our brain processes visual information 60,000 times faster than written information. Although I could not find the original evidence, I believe this must be true. Maybe not the exact number, but the essence of it. The average reader can only read about 200 words per minute. That is 200 pieces of information. Imagine how much you see in a minute if you just look around you while walking through a supermarket: Hundreds of thousands of pieces of information, easily absorbed. Our brains are hardwired and trained to process, filter and make sense of all that information. Isn’t that incredible? PackagingInsights: How has visual language in packaging design evolved over time and is its significance increasing? Pruijssers: Two aspects have played an important role: Firstly, in marketing and consumer science, we have become more aware of how important visual language is in retail environments, where shoppers make decisions in extremely little time. Secondly, printing technology has advanced in the past couple of decades. We are now able to print high-resolution full-color images on almost every material, flexibly and at very low cost. This enables us to fully exploit the power of visual language in packaging design. As a next step in the evolution of visual language in packaging design, I see a shift towards considering design at shelf level. This calls for maybe less, but more impactful visual language. Consumers can only handle so much information and suffer from information overload. I see a great trend towards what I call “distinctive simplicity”: Simple designs with one powerful visual image, a logo and name. No frills. PackagingInsights: What sort of techniques can FMCG brands use to improve the visual language on their packaging? Pruijssers: Measuring efficacy instead of judging aesthetics. The most beautifully designed option is often not the most effective design for being noticed, being found, or for getting a message across. Yet, many design choices are still made on the basis of intuition and personal preference of the designer or the client. I am a great advocate of scientific and research-based packaging design choices. PackagingInsights: How significant is color in effective visual communication? What sort of influence can it have on brand recognition/appeal? Pruijssers: Color is used for several reasons. Indeed, brand recognition can be an important reason. Some brands have even registered a specific color as part of their brand. Other reasons can be the semiotic meaning of color, or because certain colors can help to identify specific flavors, like pink for strawberry. Sometimes color codes are universal, sometimes local. In dairy, for instance, green means “yogurt” in the Netherlands and “semi-skimmed milk” in the UK. 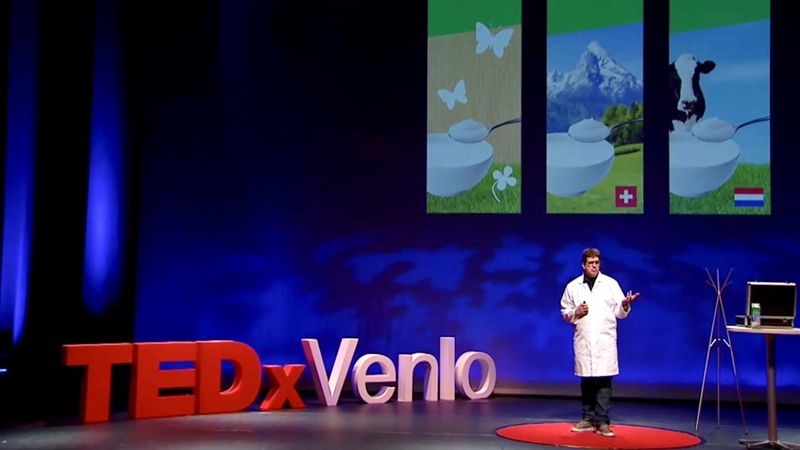 Click to EnlargeMarc Pruijssers presenting at TEDx Venlo in the Netherlands. PackagingInsights: Can you give one or two examples of recent product launches which have made effective use of visual language on their packaging? Pruijssers: Lay’s is a brand that makes very effective use of visual language. 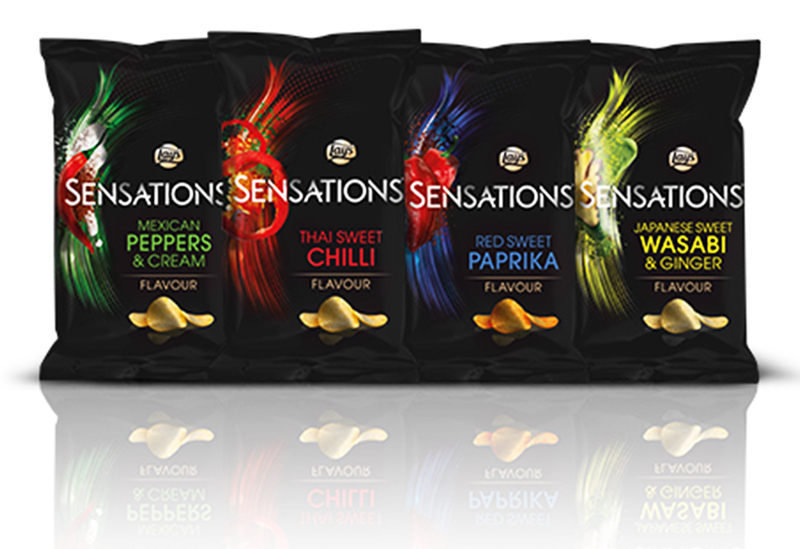 In Europe, its premium Sensations crisps range makes use of the color black, a small brand logo, powerful bright and vivid photography, and simple and light sans-serif capitals to cue luxury, flavor intensity and exclusivity. Its premium Mediterranean range on the other hand, uses a matt film with craft paper background, handwritten fonts and a drawing, instead of photography, of a flask of olive oil, to position the product as a natural and honest, artisanal Mediterranean product. PackagingInsights: How might the rise in online retail affect visual language in packaging design? Pruijssers: At this stage, online retailers primarily put images of physical retail packaging on display. As online retail continues to grow, this could change. Maybe brands will provide other imagery for display in online shops rather than just a picture of a pack. If some of the branding, positioning and communication functions of packaging will be fulfilled by online graphics, these functions may become a less important aspect of online packaging. I can imagine that packaging for online retail will becomes less branded, or differently branded, in the future. Watch Pruijssers' presentation on visual language here.